You may have seen a friend or a family member invest his money in stocks, bonds, ETFs and options. If you intrigued by the idea of making money in investing, you should really first understand what investing is all about. When you invest, you are committing capital or some other resource in expectation of increased wealth sometime in the future. You could draw an analogy between investing and many other things in life. For example, a college education is an investment of time and money (tuition) so that you could get a better job and earn better income you would be able to without a college degree. Buying stocks or bonds is not too dissimilar: you are paying money now hoping that you will get even more money later. This may sound somewhat like gambling, but you really should approach gambling and investing with a different mindset. Here, we explain the basics of investing, and demonstrate how to think about investments in a measured and prudent way. Investors make money mostly through three ways: appreciation, interest payments or dividends. Appreciation means that the value of an asset has increased. If you purchase a stock for S$100 and its price goes up to S$150 in five years, then the stock has appreciated in value. This is the most commonly talked about way of making money on investments. Interest payments and dividends are also quite easy to understand. You probably have paid interest on a loan you’ve taken out before, whether that was a student loan or mortgage. On the other side that process is the investment, and bonds and dividends work the same way. When you buy a bond, you are lending money to the government or a corporation, who promises to pay you back and make interest payments at a predetermined rate. Dividends are “interest payments of stocks,” where corporations issue portions of their profits to their stockholders. Simply by holding a stock of a company, you are entitled to receive that firm’s dividends, which is an investment return on top of any appreciation in the value of the stock. You should note, however, that not every firm will issue dividends. Every firm has a different policy on this issue, and may decide not to issue dividends if there are other more pressing issues like vast growth opportunities or business troubles. Although you might think of investing as a way of earning money, it is also a dangerous activity with its own set of risks. 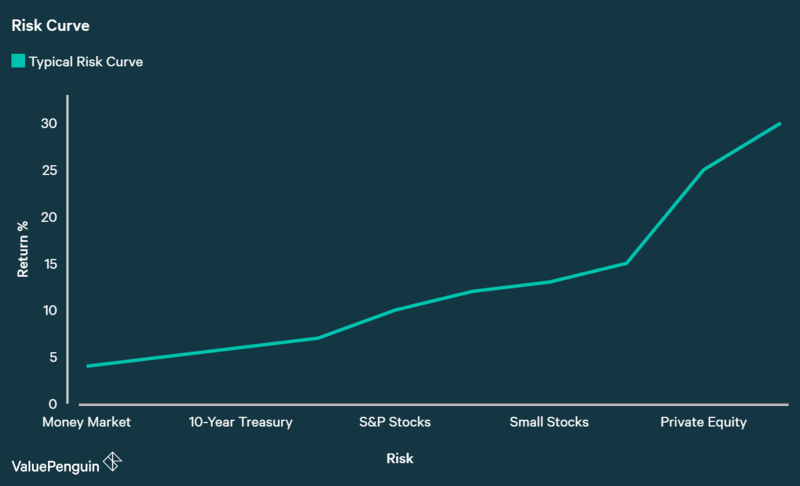 The biggest risk with investing is that you may lose some or all of the money you invested. Unlike savings or checking accounts, whose value is guaranteed by the banks, investments usually have no such guarantee. You should always be wary of tempting advertisements that say “guaranteed return of X%.” There is no such thing as a free lunch. Typically, risk and potential investment return go hand in hand. Higher the risk, higher the return. To put it simply, you wouldn’t want to take a big risk if you didn’t think there was a potential for a big payoff. Conversely, if something had very little risk but very high upside, everyone would flock to that investment opportunity, driving up its price and decreasing potential return. This tendency is also demonstrated by what is called a risk curve, demonstrated below. Investments with the lowest risk profile (like government bond) have the lowest return, while risky opportunities like venture capital typically promise higher return. Some people may liken investing to gambling. And if you invest nonchalantly without doing your homework, you practically would be gambling in a casino called the stock market and riding the emotional rollercoaster whenever you win or lose money. However, smart investors approach investing strategically to choose investments that have a good expectation of return. By understanding your investments well, you can withstand the short term volatilities, and keep your emotions in control. Investments tend to be volatile in the short term, and it could be difficult to watch your investments lose money. This can lead to investing decisions based on fear or panic, such as selling stocks when the prices fall too low for your comfort. To minimize such a risk, it’s important to know what you are investing in. For instance, would you ever pay S$100 for a glass of milk? Do you do absolutely no research before buying a car or a house? Probably not. You have a general sense of how much most things like a bag of chips, a bowl of laksa noodles or a cup of coffee should cost. Similarly, bonds and stocks have a value attached them and you should try to get a sense of what they are worth, and what could impact that price in the future. To do this, you should commit to conducting a fair amount of research and study before buying a stock or bonds. For instance, you could learn about how the company earns money, who the competitors are, or if the company is financially healthy. Or you could research what correlates with the stock price’s fluctuations. There is a plethora of investment strategies out there, and you could choose one that you understand well or are drawn to the most. Just make sure you are fully aware of what you are buying, why you are buying it, and what could go wrong. Just as you do before buying anything else, do your homework. Trick is to buy things you understand so you are aware of what kind of risks you are exposed to, and to pay a discount to the “fair value” just the way you shop for things that are on sale. Another way that investors reduce their overall risk is by diversifying their investments into a variety of different securities. For example, you could build a mixed portfolio of different stocks, bonds and real estate. As an investor, you must accept the fact that you will be wrong and lose money on some of your investments. If you didn’t, you would probably the richest person in the world already. Sadly, none of us can predict the future with 100% accuracy. Therefore, it’s important to diversify your investments so that you can be wrong sometimes and still make money in your portfolio as a whole. Then how much should we diversify? Surely, it would be impossible to invest in 1,000 stocks and understand all of them well. But, it might not be enough to own only 5 to 10 stocks! How do we hit the right balance between understanding our investments really well and diversifying sufficiently? To this, our answer is: find out for yourself! Most people have different degrees of ability, time and risk tolerance they can commit to investing. If you can handle 30 to 50 stocks, by all means you should do so! If you can’t, it might make more sense to invest in fewer places, though such a strategy could increase the volatility of your portfolio. In general, studies have shown that benefits of diversification diminishes greatly after you hit 30 stocks in a portfolio. When you think about investing in terms of compounding and time, it’s easy to understand why people would risk their money for a potential return. 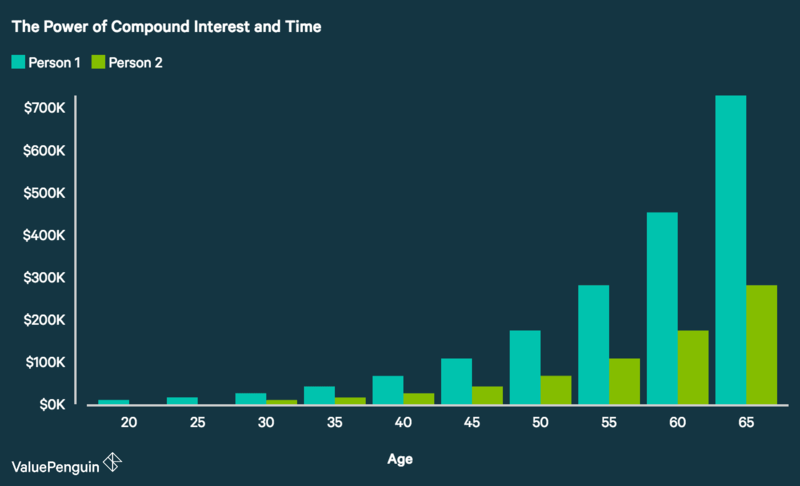 You may remember learning about compound interest in math class, but if your memory is fuzzy here is our simple summary: compounding interests allows your money to earn money for you over time. When your money can compound over a long period of time, the growth can become exponential. In the chart above, we compare two people who invested $10,000 with no additional investments and earned a 10% return every year. This means that after one year they would have $11,000 ($10,000 x 10% = $1,000 and $1,000 + $10,000 = $11,000). However, Person 1 began investing at age 20 and Person 2 began at age 30. By age 65, Person 1 has more than double what Person 2 has thanks to 10 extra years. It’s like what Warren Buffett said: the best thing you can do for your retirement savings is to start investing early. First, you need to understand what type of account you will open, how much you have to invest and what you will invest in. Are you young, and have a higher risk appetite? Or are you close to your retirement and just want a steady and reliable cash return? Also, for most people, it’s advisable to own some ETFs or indices that are well diversified. Even the pros who spend all of their time investing are known to be good stock pickers only 60% of the time, and you might be better off owning an ETF or index that charges very little fees and provides an already diversified portfolio. With whatever strategy you choose, make sure you do your research and understand all of the risks involved: you will be a better investor if your investing decisions are based on logic and reason rather than emotions.